Suddenly, came the realisation that subsidised wind and solar will never replace Australia’s coal-fired power plants. The idea that they ever could was, of course, a perfect nonsense. Talk about being ‘technology agnostic’, ‘inevitable transitions’ and wind and solar actually ‘competing’ with coal, gas and hydro, say more about the protagonist’s state of mental health, than anything else. When it’s pointed out that on a dead-calm, frosty morning in July (when people have bounced out of bed, but the sun is yet to bounce over the horizon) every last volt, watt and amp is the product of coal, gas and hydro, the dissembling soon starts. No amount of money or green virtue can purchase wind or solar power on those occasions (and on thousands of others whenever the sun sets or calm weather sets in). Then follows mutterings about the ‘technology improving’; Einstein-‘smart grids’; ‘mega-storage’ (be it squandering large volumes of electricity to pump water uphill, or insanely expensive batteries, as yet to be built); and ‘demand management’ (ie controlled blackouts). Then, out of the blue, came an admission from Australia’s head RE zealot, Audrey Zibelman. Audrey hijacked the Australian Energy Market Operator with a mission to destroy Australia’s affordable and reliable power supply. So successful has she been, that she’s been forced into a renewable energy retreat. Pushing policies designed to wreck the economic viability of coal-fired power plants, Audrey is now dictating terms whereby they will continue to operate until such time as wind and solar are truly, finally and actually ready to ‘compete’. Because ‘competing’ in a market that demands power as and when consumers need it, means being capable of delivering 24 x 365. Which – unless Audrey thinks she can control the weather and the Earth’s rotation, too? – rules out wind and solar any time between now and kingdom come. Here’s Alan Moran rounding up a very panicked mob of renewable energy zealots. Like dogs with a taste for worrying sheep, politicians’ destructive meddling with our energy regime appears to be a compulsion. As Australia’s debacle grows ever more ruinously absurd and an election approaches, has it not occurred to them that betraying the flock invites summary justice? The latest AEMO report follows the now well-trodden path to disaster. It ostensibly offers a blueprint for what it regards as “the least-cost option for an orderly transition to renewables”. As AEMO chief Audrey Zibelman says, “We are witnessing disruption across almost every element of the value chain … Care must be taken now more than ever to manage this transformation in order to minimise costs and risks and maximise value to consumers”. But there is no discussion of this transformation being caused by subsidies, the latest encapsulated in the 26% emission reductions said to be required by the Paris Agreement. Of course, borrowing the vocabulary of “disruption” that has given us Airbnb, eBay and Amazon totally mischaracterises the causes of the disaster in electricity supply. The disruption in electricity supply is an outcome solely due to regulatory intervention and not attributable to technological developments bringing new supply systems that out-compete existing providers. Ms Zibelman describes AEMO’s report as providing a bridge to a future where renewables will triumph as the lowest-cost source of energy. A succession of future coal generator retirements is logged. There is no suggestion that new coal will be built, despite coal’s competitiveness being illustrated in the thousand-plus units under construction globally and the stated ambition of at least two significant players (Sunrise and Alinta) to build new capacity. Neglected is the ACCC’s call for government contractual support for new “firm” capacity (i.e. coal generators, though the ACCC’s conditions appear to rule out such support for Sunrise and Alinta). Nor does AEMO appear to take into consideration the sensible ACCC recommendation to terminate the roof-top solar subsidy. AEMO modelling has the renewables share of capacity and generation at 50 per cent by 2030, in line with the ALP goals! Here is its model of generation over the coming years. Actually, in what the International Energy Agency’s green promoter Fatih Birol calls a “worrying trend”, global investment in renewables fell last year and is also down this year. Much of this is due to reduced subsidies, especially in China and doubts about future support elsewhere. A further massive expansion of transmission after 2030 as the coal capacity is retired. 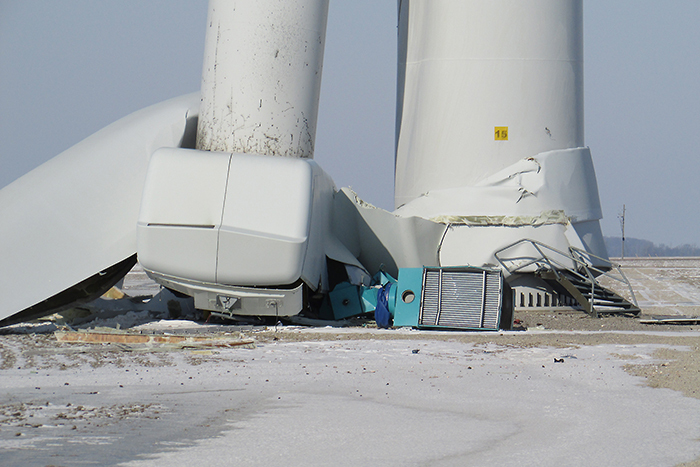 At least there is no longer talk about the early closure of coal-fired power stations to allow new wind and solar more room to enter the market – indeed, the concern is to prevent premature closures. But faith is pinned on the coming displacement of fossil fuel by renewables that – as has been the case for 35 years – are teetering on the brink of being lower cost. AEMO emphasis is on the attendant requirements for new transmission in light of the replacement of coal by wind, solar, pumped storage and batteries. The report avoids specifying cost estimates for all this, limiting itself to “key observations” that envisage a benefit to consumers of $1.2 billion from the transmission developments it proposes. Although some of the REZs are said to have surplus transmission capacity, this paves the way to having the costs smeared across consumers’ bills, rather than being incorporated in the providers’ costs. As the ad puts it, “That’s not what it says in the instructions, Harold”. The Code, which the AEMO is ostensibly applying, calls for new transmission to be paid for by the beneficiary. If a new supply source enters the market, it and not the consumers should pay for any costs involved in getting the electricity to the customers. So, winner-picking and subsidies to the Politically Correct renewables remains the order of the next three decades. Even with the heroic assumptions of an impending increase in renewables’ competitiveness, the market regulator recognises that they’ll still need a leg-up into the 2040s! With all the reports available and the flexibility of the proposed National Energy Guarantee’s moveable carbon tax goals, we are nowhere near the regulatory certainty that is a supposed goal of all these models and strictures. We are even further removed from restoring Australia to having the world’s most successful energy industry. Like dogs with a taste for worrying sheep, politicians are addicted to continuing their destructive interventions in energy supply. And they have created an endless supply of officials and vested interests who will tell them how they can vary those interventions but they have little stomach for disengaging and allowing the market the freedom to operate without regulations and guidance. The ‘lynch’ mob is growing everyday – not long now before they spill onto the streets. Advice to Ms.Zibelman, go home now before its too late but its too late for those who appointed her, the game is up. I don’t know if going home is such an attractive option for Audrey, with allegations of conflicts of interest hanging over her head concerning her family involvement in the promotion of so called smart grid technology (some call it ‘hippy grid’ technology). With the advent of Trump’s ‘swamp draining’ administration one suspects things might be becoming a little uncomfortable for renewables zealots like Ms Zibelman. The problem with the green dream is the storage. Once you enter a point where you need RE for baseload, which is the point we are about to reach now, then you must have storage. The problem is that storage is extremely expensive to build and doesn’t generate any revenue once in operation. In fact it is a net energy user of the grid. The result is that there are no plans to build storage from the private sector, other than a few tiny batteries that are only useful for load regulation. It’s worth noting that the Turnbull snowy 2 plan will cost around $10B to build and has an efficiency of 70-80%, meaning it will consume around 500MW of energy to deliver its 2000MW discharge. Because it loses money in operation it can’t pay off it’s initial investment and therefore it will never get approved by cabinet unless the greens are running the show. And of course it only has a 7 day storage capacity. How many such white elephants of this type would you need to realise the green dream, even if you ignore the impact to power bills ?. Most likely you would need 6 to 8 such plants and even then the risk of exhausting the storage and killing the grid (along with us) is too high. A month of calm weather in winter is probably all you would need. One wonders how this is going to end ?. Retail power prices will continue to rise and the eastern states will experience the blackouts and load shedding that became the norm in South Australia. Once Sydney or Melbourne go black, the push for renewables is over. The crazy part about the costs and logistics is that they are completely obfiscated from any discussion in the MSM and political arena. If you wanted to build a single Liddel sized wind farm (2GW) with one week of backup using pumped hydro, it would cost somewhere between $20 and $25Billion dollars, requiring around 8GW of installed wind capacity to cater for the CF and losses from the PH. Despite this massive cost, people still claim RE is cheaper than coal. If you use solar rather than wind for the generation, the costs are even higher, with lower CF and the issue of needing to base the solar panel capacity on the June solstice insolation levels. Of course, the RE plant will only last 20 years, compared with 40 years for a coal plant, which makes the cost situation even worse. The logistics of building PH is where is gets extremely amusing. You need to consider land aquisition for all the PH storage dams (top and bottom), easements for the huge pipelines, transmission lines, power generation plant and the long timelines for the environment impact study. When you factor in all the complications you end up with just 1 x Snowy 2, which has dams already in place and is on government land. To do PH elsewhere on the kind of scale needed for RE grid strorage is not even remotely feasible. If you look at what is being proposed to swap out Liddel it is a complete joke. The only explanation as to why the RE transition plan is still alive today is that the energy companies know as we move into the red zone and remove more coal, it will have a very large inflationary effect on prices as well as grid security. By the time the pollies and MSM realise they have been duped it will be too late. The energy companies will then recieve large subsidies to fast track coal plants, which I’m sure is already factored into their roadmap. For $25 Billion you might get 3 GW of Nuclear Capacity that will last 60 to 80 years and be available 24/7 and occupy a much smaller footprint. $10 billion is the approx cost of a Westinghouse AP1000 Nuclear Reactor which delivers reliable dispatchable electricity 24/7. No CO2 emissions to bother global warming alarmists and fits on a couple of football fields. That climate zealots are not pushing nuclear power speaks volumes. Only one, I repeat one reactor and two generator units when $10 billion would buy you four coal fired power stations each with the same output as the one nuclear plant ans each a lot less costly to run. Remember you then have to transmit that power around the country. A lot more sensible to have four plants distributed around the country with transmission losses in mind and the cost of operation and redundancy. How it’s going to end LOLOL, In a word Disastrously one would think. 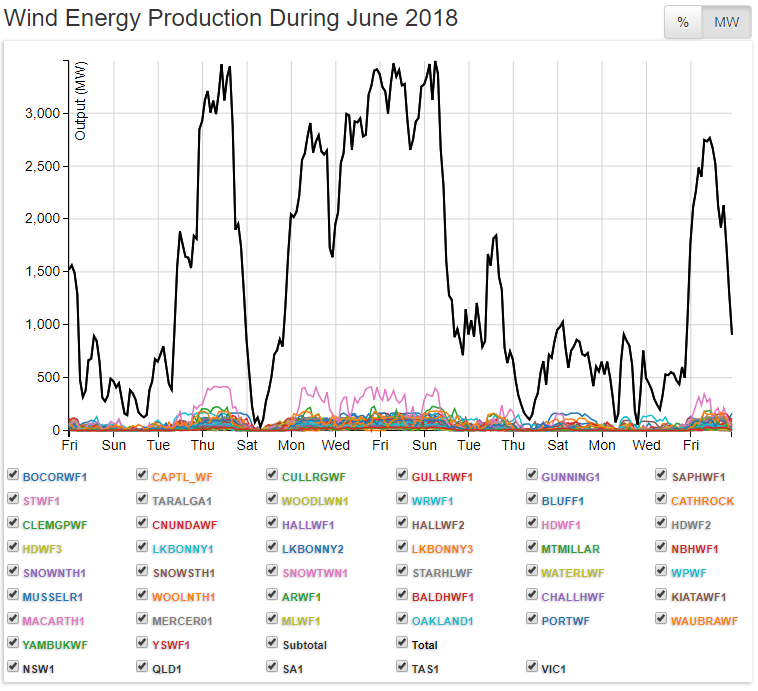 Just take a serious look at South Australia, here we have 100% renewable generation powering the state backed up by gas powered generation, diesel powered gas turbines and a 700MW umbilical cord connecting to a brown coal fired power station in another state which relies on NSW for it’s shortfall in power when the wind doesn’t blow also, and NSW in turn relies on a large amount of its power from Queensland’s reliable cheap coal fired power stations every day.. If this is the future of renewable energy then once the other three eastern states join in on the madness of renewable energy the big question will be where they expect to build their system saving umbilical cord to?????? New Guinea or China !!!! One wonders if Ms Audrey Zibelman isn’t starting to look over her shoulder at what happened to Enron and the CEO Kenneth Lay who escaped a 32 year prison sentence by dying. Some one or several people will have to pay the ultimate price for failing to look after the public interest after being paid millions to do so. The problem is those in charge as still working in the fog of stupidity created by blowhards from the industry. It’s been shouted loud and clear for years that it’s not possible for wind and solar to provide us with the energy we need, that backup is and will always be needed. We are faced with people so fixated with W&S that they cannot extract themselves, the industry continues to feed them the lies and they hungrily swallow them. Listening to the youtube video Crispin Trist provided of the Hawkesdale meeting shows what is happening when someone on the panel said the Government has a Target and a Policy. From that you can workout it follows the project assessment panels set up by the governments have to work within the Policy to meet the Targets so no matter what truth is presented about harm, uselessness, cost or inadequate standards these projects are going to be given approval. When these panels stop following blindly the will of the Government(s) and start saying NO to projects ‘on mass’ then and only then will Governments start to see through the veil the industry has put up and realise people of this nation are worth listening to and working for – NOT an industry so determined to grab the money and run, leaving behind mayhem. Until Governments at all levels accept its the people of this nation they are working for and its the people of this nation that make it great NOT POLITICIANS or their policy manipulators then we might find ourselves with some worthy politicians who could seriously be considered ‘Statesmen/women’ working for the good of all. With a return to sensible and viable economic energy policies.